Hello everyone! It's Kim from Katydid Cards with you today to say, "You know you're old when..."
Boy, we can finish that sentence in any number of ways, can't we? 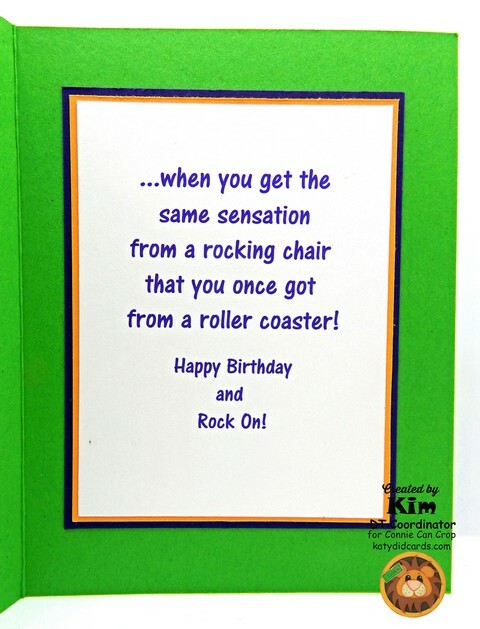 My card, featuring an image from our sponsor this month, Bugaboo Stamps, offers one way to complete the thought! 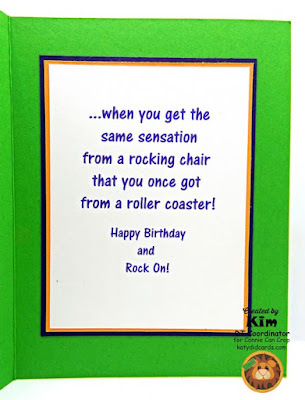 For this card, I used the Stella-Rocking Chair image. Stella is a cantankerous old gal and has no problem in sharing her somewhat tarnished opinions...as I get older I find some of my opinions are starting to sound like hers! Time for an attitude adjustment, I think! To create the focal panel, I imported the image into my design screen and traced around the outside edge. I welded it into a rectangle so the balloons extend slightly above the rectangle. Next, I traced around the front balloon and the presents at Stella's feet so I could pop them for added interest. 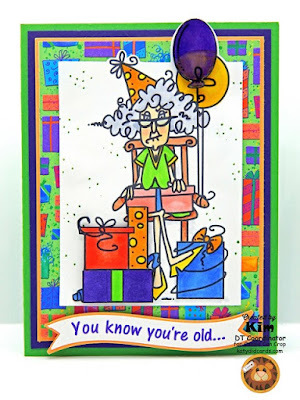 Stella is matted on a rectangle I filled with digital patterned paper from the Party Time Kit by Amanda McGee. I added two additional mats of Peach Parfait and Concord Crush before adding all to a base of Cucumber Crush (all retired Stampin' Up cardstocks). 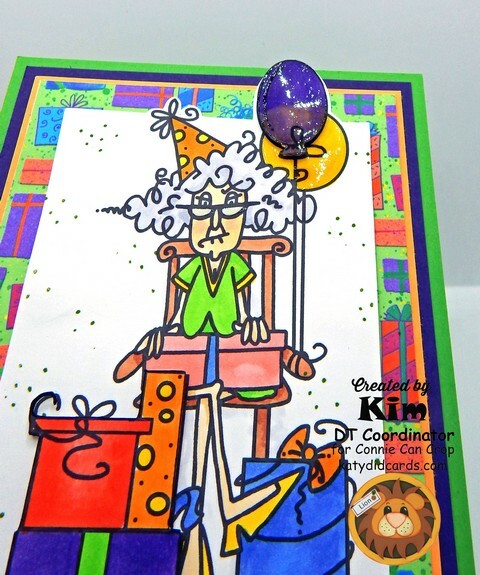 To finish, some Glossy Accents on the balloons and her glasses. The greeting was color matched to the purple in the patterned paper and printed on a curved banner using the text to path option in my Silhouette. I matted it on the peach card stock. Inside, I printed the sentiment in the same purple and double matted before adding. I can actually relate to this; sad but true. And there are times when I don't even need to be in a rocking chair to get that sensation! 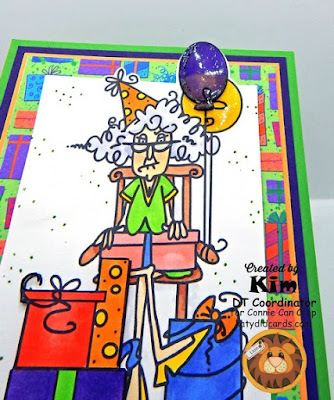 Have you participated in Connie Can Crop's monthly challenge yet? You still have the rest of the month, so get crafting! 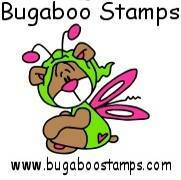 One winner, picked at random, will win their choice of four digital images (a $12 value) from Bugaboo Stamps. 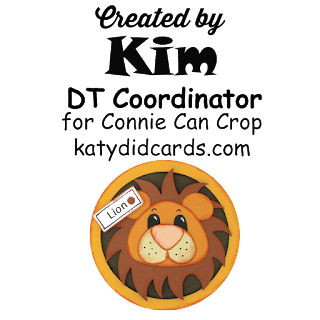 Visit them at their store to see what they have and check them out on Facebook to see the latest. To obtain more information about the challenge or to link up your project, just click here. SO fun! Love this and Stella! Super cute card. I love this Stella. This came out so good Kim! Really CUTE!! Great image. TFS.